If you live in or are visiting Myrtle Beach, South Carolina, you more than likely passes through Carolina Forest on your way to the Grand Strand. One of Myrtle Beach’s fastest growing commercial and residential areas, Carolina Forest, located between Conway and downtown Myrtle Beach, is well known for its large green sign at the 501/Carolina Forest Boulevard intersection. This community is hope to top performing schools and exclusive neighborhoods. As it grows, Carolina Forest is finding little need to leave their nook for other services. 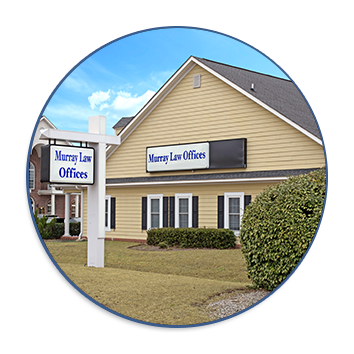 To better serve this growing community, Murray Law Offices chose Carolina Forest as one of our 4 locations. Whether you are looking for legal services in Georgetown or Horry County, our South Carolina attorneys are here to represent you in case of an accident, injury, criminal charge, traffic violation, real estate closing, estate planning, and family law needs. Have you found the perfect residence and are ready to purchase? Are you looking at signing a contract? For your real estate closings, wills and business formation needs, ask for a managing attorney. Did you have a car accident or receive a traffic violation while traveling the Grand Strand? Do you have a family member who was injured or whose life has been lost due to someone else’s negligence, medical malpractice, or nursing home abuse? Are you in need of a divorce or Family Court Lawyer? Has someone served you with a lawsuit? Ask for our team. Whether you are local or a visitor we want to help you. Reach us today at 843-286-1000 or by email.